First, I want to say a HUGE thank you to Jennifer at Chaos2Peace for co-hosting with me for the month of May! It was such a blessing to have her helping me this past month! Be sure and stop by Jennifer's blog and say "howdy!" With summer just around the corner, I've done lots of thinking. I'm really wanting an intentional summer where the kids and I just really focus on being together and having fun. With that, I've decided to give the link-up a summer vacation too! I'm still going to blog but by putting the link-up to the side, I can put more time and energy into pool dates, lemonade stands, and impromptu road trips! I know you guys will all understand! Thank you, thank you, thank you for linking up with us each month and I look forward to starting the link-up again in September! But, summer hasn't started just yet - let's have one more link-up before we go! What am I waiting on? 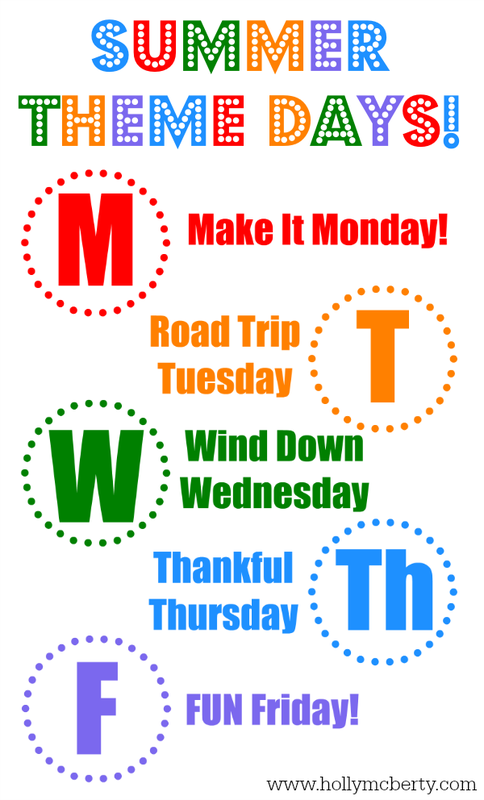 Next week will be our first week of summer and I'm looking forward to all kinds of fun stuff! We've got a little project in the works for Monday, a quick road trip on Tuesday, and on Wednesday I think we'll hit the library and get new library cards (and also check the first item off our bucket list!). I hope you guys have a great summer!!! I'm looking forward to them too, Keri!!! I love having theme days for the summer! That's such a great idea. You know, I sure hope your kids appreciate just how wonderful you are!!!! You are too kind, Nina! We've never tried summer theme days but I LOVE a good theme so I'm hoping the kids will like it too! Thanks for linking up! Thank you so much, Donna! It does pass SO quickly!!! Thanks so much for stopping by and linking up! I'm so glad that you and my friend Jennifer Shack are buddies! Y'all are both amazing women! You are so sweet, Melanie! Thank you for your sweet words. Jennifer is awesome and I'm so glad I've "met" her through blogging! Hope you're having a great summer! Thanks for hosting and have a wonderful weekend. Got one more week to go. I'm a bit late replying - sorry! Hope you're having a great summer! I'll miss your link up this summer, but look forward to reading all your adventures with your family! Thank you so much! I'll miss seeing everyone here each Wednesday too!